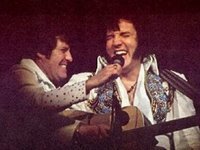 This interview was conducted as an informal chat between Charlie Hodge and Nigel Patterson (from EIN, then known as the ACT Elvis Presley Appreciation Society) over a few drinks during Elvis Week in 1986. It was one of two chats between Charlie and Nigel. This interview first appeared in the monthly fan newsletter, 'The Man From Memphis' in 1986. It has not previously been published on the Interrnet. EIN: Charlie, for those fans who don't know, when did you first meet Elvis? CH: It was in Memphis in 1956. I was big with my Foggy River Boys and Elvis came backstage when we were touring on Red Foley's Ozark Jubilee. Elvis came in with his cousin, Billy Smith. I talked to Elvis and Billy about the music scene and we swapped stories. Elvis told me he watched me every week on the Ozark Jubilee. It was a popular TV show broadcast on Saturday night's out of Springfield, Missouri. After that, the next time I'd see Elvis was in the Army. EIN: Tell us about that..
CH: Elvis and I went into the Army at the same time but we weren't stationed together. When I found out where he was I went over and renewed my acquaintance. I said, "I'm Charlie Hodge. I was the lead singer with the Foggy River Boys". And he said, "Hey, man, I used to watch you every Saturday night on TV". We had a natural friendship, because we were similar in a number of ways. 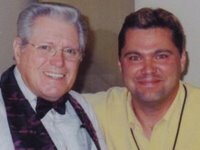 We both loved music, we both wanted to be in a gospel quartet, we knew the same people in the gospel field. We knew the same people in the country field. And we sang gospel songs together on the way to Germany. I was the only trained musician of the guys and I guess Elvis needed someone he liked who was also a musician. EIN: Elvis took up karate during his Army stint. What do you recall about his interest then in the martial arts? CH: When we were in Germany Elvis heard about the karate champion, Jurgen Seydel, who was also in Germany. He arranged to meet Jurgen and they started training together. As I wrote in my book, Me 'n' Elvis, karate was a physical art that caught Elvis' passion. Elvis and Jurgen became very close and they'd work out together on weekends. 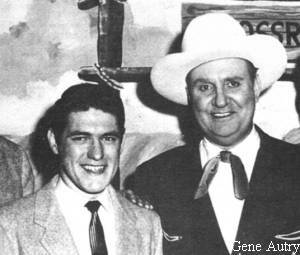 Rex Mansfield, who was with us in Germany, also took lessons, and Elvis would work out with him whenever Jurgen wasn't around. EIN: Elvis was a big fan of Mario Lanza? CH: Elvis loved all types of music. He always wanted to know more about how the music came about, how particular singers and musicians did certain things. And he was a big, big fan of Mario Lanza. He watched movies like The Student Prince over and over again. Her especially liked how Lanza projected his powerful voice and the notes he could reach. I think Elvis would have loved to have been an opera singer. Just imagine how that could have changed music history! EIN: Charlie, tell us about life at Graceland. 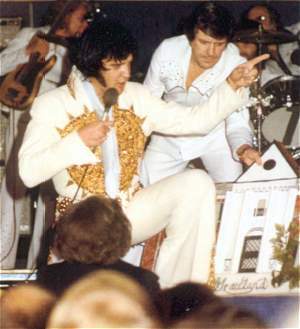 CH: Let me tell you, Elvis just loved Graceland. It was his island away from the world where he could unwind with his family and the boys. I was very fortunate to have lived there until after Elvis died. I remember that Elvis would wander around Graceland singing. I'd hear him and pick up the harmony. Sometimes we weren't even in the same room. EIN: Elvis also loved Hawaii. CH: You got that right. Elvis used to say the people of Hawaii were among the friendliest he ever met. He loved their customs and their peacefulness. And he could go there and they wouldn't mob him like they did everywhere else he went. We'd go to Hawaii for a holiday, to relax on the beach and play on the beach and in the water. Elvis didn't like to swim much but he sure liked to play around in the water. And of course he did his world famous Aloha concert from Hawaii, the first ever satellite concert beamed right around the world. Over 1 billion people watched that show! One of Elvis' favorite TV shows was filmed in Hawaii, Hawaii 5-0. He was a fan of its star, Jack Lord. Elvis got to meet Jack backstage after one of his shows in Vegas. Elvis also liked The Brian Keith Show which was also made in Hawaii. Anything that reminded him of one of his favorite places. EIN: How much TV did Elvis watch? CH: Elvis could be a TV junkie. 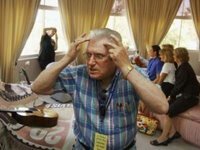 He had a TV set in every room at Graceland and four in the TV Room so he could watch all channels. He liked watching sport and he liked a lot of the comedies like Lucy and The Beverly Hillbillies. He was big on war movies too. He admired John Wayne and Patton was one of his all-time favorite films. A lot of the time though if he was making a picture or out on the road we didn't get to see much TV. CH: You know I've read a lot of wrong things about Elvis and Priscilla. Elvis loved her, he told me that many times. And while he may not have wanted to get married when he did she was the love of his life. 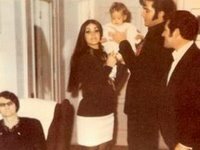 Initially, we all got along well with Priscilla but after a while I guess she wanted more time with Elvis and we were always around. You can understand that even if we didn't like it at times. It's only natural for her to want to be alone with her husband. Priscilla was good with us. She could be tough when she wanted and that was usually when the rest of the guys all came over and would start putting in orders with the cook as if Graceland was a restaurant or hotel. She used to say "This isn't a short order restaurant!" (laughs) I lived at Graceland so I guess I knew her better than most. CH: The Colonel was a character. I got on well with himand he used to entertain us with stories of his days as a carny. He especially liked telling Elvis and the boys his stories around the dining table. He'd puff on a big cigar and tell us stories he'd told us a hundred times before. But he was a natural born entertainer and he could make you laugh. He wasn't the ogre many people make him out to be. One of his favorite stories was the hot dog trick he pulled on customers during his carny days. The disappearing hot dog. The Colonel would drop a hot dog in the dust in front of the counter where the customers lined up to buy the hot dog. The carny would wipe a bit of mustard and catsup on an empty bun and give it to the customer. Of course the customer would complain there was no hot dog and the carny would look at the hot dog on the ground and say, "Look there, you must have dropped it." The Colonel could be a rogue, but he was also very likeable. And his stories kept us in stitches a lot of the time. He was such a colorful character. The Colonel was not a person you messed with. He could be very, very tough when he was displeased about something, but usually he was a fair person. EIN: The Memphis Mafia. How well did you guys get on? CH: We got on real well. We laughed, we cried, we partied, we played practical jokes together. Like any group closely living and working together, there were times when tempers ran hot but they cooled off quickly. It was a fun time and there were a lot more good times than not so good times. There were many members of the MM. Some of us were there from the start and others drifted in and out over the years or were there for only a short time. Elvis knew who he liked and who he wanted to be in the group. EIN: Elvis used to give the Memphis Mafia guys nicknames. What was yours? CH: Elvis called me a few names but the main one was "Slewfoot". It's a well known name in country music circles in the Southern statesof the US. Jerry Schilling was "Cougar", Joe was "Lion", sometimes "Diamond Joe", Lamar was "Buddha" or "Lardass" because of his size. Elvis always liked nicknames, I think for him they symbolised closeness between friends and also the secret nature of groups where only those inside know what it's all about. A lot of the nicknames Elvis gave out were influenced by his love of karate. EIN: Did Elvis drink alcohol and smoke? CH: Elvis rarely touched alcohol. It was not something he cared for. When he was younger he smoked occasionally. There are a few pictures of him with a cigarette. And he in the late 60s he liked smoking cigars. He'd go through phases like that where he had a passion for something, then before you knew it, it was something new he was trying. CH: There have been so many nasty, misinformed things said and written about Elvis and so-called "drugs". So many people, especially the media, want to put him down. I never knew Elvis to take 'street drugs'. He despised them and the pushers behind them. Yes, Elvis took medications, but they were prescribed for him by Dr Nick. And they were for very real conditions Elvis suffered from. Not only that, Elvis knew all about the interactions between the medications he was taking. He had a copy of The Desk Physician's Reference Guide with him all the time. If he'd wanted, he could have become a pharmacist, he knew that much about drugs and their interactions with each other. He was a walking pharmacy encyclopedia. EIN: The Colonel is well known as a gambler. What about Elvis? CH: Elvis didn't care for gambling. He might do it if he was bored to pass the time. But he never gambled much. I remember one time in Vegas he put a $ coin in a slot machine and he hit the $100.00 jackpot. Elvis went on playing the machine and every few coins he'd hit the jackpot again. It turned out the machine was faulty. The pit bosses got upset but they couldn't stop Elvis from playing the machine and he wasn't going to stop, he was having too much fun. EIN: Do you think Elvis would have married Ginger Alden? CH: Well, they were engaged. I can confirm that. But whether Elvis would have married her I don't know, but I doubt he would. There was some friction between them when Elvis died. EIN: Elvis not touring overseas is one of the frustrating parts of the Elvis story. What can you tell us about it? CH: Man, touring overseas was a real big issue for Elvis. He wanted to tour Europe badly and especially wanted to perform in Germany and France as he had such happy memories of being in both countries. He wanted to repay the people for their hospitality and of course his fans in other countries. There were so many big offers for Elvis to perform in other countries and we never really knew why the Colonel said no to them. We used to talk about why it never happened. Sometimes the Colonel would say it was security concerns or there weren't suitable auditoriums and other times the price of tickets would be too high. But it used to annoy the hell out of Elvis. He got very angry about it more than one time. EIN: You appeared in several of Elvis' movies. What was that like? CH: I had small parts in Clambake, Speedway and Stay Away, Joe. 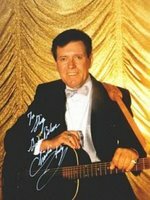 I cut Elvis' father hair in Clambake and he wouldn't sit still for me to do it. It's a funny scene. James Gregory played Elvis' father in the film. Most of the boys got to appear in one or two of the films. Elvis loved making pictures and even though he got tired of it towards the end it was usually a fun time on set. Some of the directors didn't like how we played up but most realised it helped us let of steam and the frustrations of a boring day on the set. And it was Elvis who would usually start it all. He was a real practical joker. It was his way of unwinding from the boredom and pressure. It was the same when we were on the road. It was tiring and boredom could set in quickly. Spo the practical jokes kept everyone up. J.D. Sumner was just as bad as Elvis. He loved a good practical joke especially if it wasn't on him. Elvis had an accident before filming started on Clambake and while it wasn't one of his favorite experiences we sure had fun. I remember coming out on set one morning and , splash, they got me with a bucket of water. And as I looked up, splash again, they threw a second bucket of water on me from high up in the catwalks. My shirt was soaked through and I took it off and put it near a heater to dry. I got a new shirt from wardrobe and every so often I'd go back and check to see if my shirt had dried. Well it ghadn't and I couldn't work it out. Then one time I looked around the corner (laughs) and there was Elvis spraying it with a fire extinguisher. Arthur Nadel was the director of Clambake and he got hit so many times by firecrackers he started coming to the set wearing a Nazi war helmet. The crew got their own back on Elvis one time though. It was at the end of filming of That's The Way It Is. Arthur Nadel was the director of that one too. As soon as he yelled "WRAP" Elvis got hit, as did anyone around him, by hundreds of pies. It was mayhem and there were so many pies hitting the floor that it became very slippery. People were falling like 10 pins. Even though he was the victim of the practical joke this time, Elvis loved it. EIN: Do you still get royalties for your role in Clambake, Speedway and Stay Away, Joe? CH: (laughs) If only! The number of times Elvis' films are shown on TV I could be rich if I only got a $1 each time they are on. EIN: Charlie, thanks so much for talking to us.